Richard O. Snyder, Philippe Moullier, "Adeno-Associated Virus: Methods and Protocols"
Today, progress in rAAV-mediated gene transfer is so robust that long-term, efficient, and regulatable transgene expression is reproducibly achieved in large animal models. The complexity of gene transfer agents in the context of their clinical use requires investigators from a wide variety of backgrounds to have an understanding ― or at least an appreciation of ― the regulatory environment and constraints that affect vector design, manufacturing, pre-clinical testing, and clinical use, with an emphasis on patient protection. 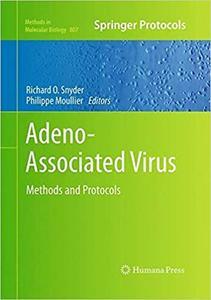 In Adeno-Associated Virus: Methods and Protocols, experts from the United States and Europe have contributed current knowledge of this multi-dimensional field relating to the biology of AAV, rAAV vector design, vector manufacturing and product testing, performance of rAAV vectors in major organs, rAAV-related immunological issues, design of animal and clinical studies, and clinical experience. Written in the successful Methods in Molecular Biology™ series format, chapters include introductions to their respective topics, lists of the necessary materials and reagents, step-by-step, readily reproducible protocols, and notes on troubleshooting and avoiding known pitfalls. 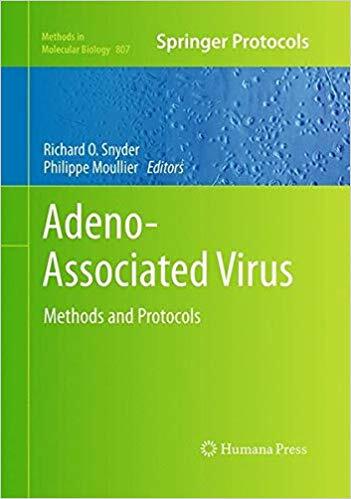 Authoritative and accessible, Adeno-Associated Virus: Methods and Protocols provides a complete and comprehensive understanding of this multi-disciplinary and rapidly progressing field.